* A bit of blogkeeping: I’m sorry for the long delay between posts! I’m still breathing, still running, and still training for my upcoming triathlon. I’ve had an exciting few weeks of wrapping up the school year and receiving a new position with my school district! Look for more posts to come soon regarding triathlon training, my experience with Jillian Michael’s 30 Day Shred and kayaking! June 9th was a bright and beautiful day in Lake County in 2013. In 2008, not so much. Why the comparison? I had a race “homecoming” of sorts this month. I returned to my first 5K to run it again, five years later. 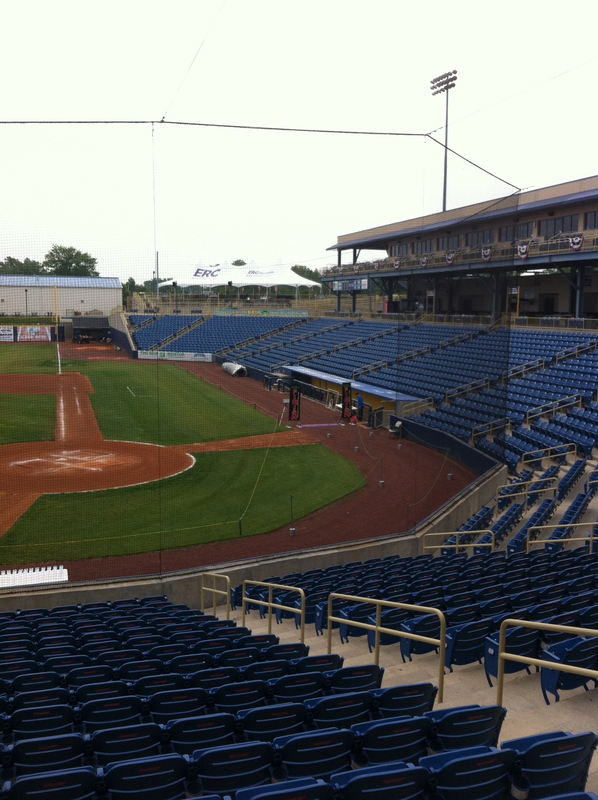 I live a short distance away from the Lake County Captains ball park, home of the Class A affiliate of the Cleveland Indians. My family and I love this ball park. If you’ve never been to a minor league baseball game, I highly encourage you to give it a try. Ticket’s are usually far less expensive than major league (Captains seats are $9) and the experience of being so close to the action is enough to get any baseball fan excited. Over the years my children have run the bases at this stadium, had the crowd sing them “Happy Birthday” (for a small fee!) and we’ve even camped out on the field while watching The Sandlot on the big screen. Back in 2008, I decided to make the Captains 5K my first race after completing the Couch to 5K program. I arrived to the race that day terrified, anxious, and sick to my stomach. It was rainy, a little chilly and overcast. As I walked up to the registration table, I looked around at all the “real” runners and decided it might be a good idea to go home. I mean, was I really ready to try to run with these people? They were all casually drinking coffee, laughing with each other and shopping at some merchandise tables set up by a local running store. I walked up to pick up my bib, figuring I could wait and make my decision in a few minutes. I was given bib number 1028. My grandpa’s birthday was October 28th. I actually cursed out loud. I couldn’t walk away from that-if I was looking for a sign about what to do, then it had just smacked me in the face. I was running. My favorite memory from that first race is heading to the starting line and having the race director yell “It’s a perfect day for running!” What?! Was this guy serious? Temperatures in the 50s and light rain was perfect for running? Five years later, I’d kiss a meteorologist if he told me that was the weather I was getting for a race. I ran the best I could, no technology, walking a couple stretches. My finishing time in 2008 = 32:07. I had no frame of reference for that time-was it good? average? awful? I didn’t care, I had finished. 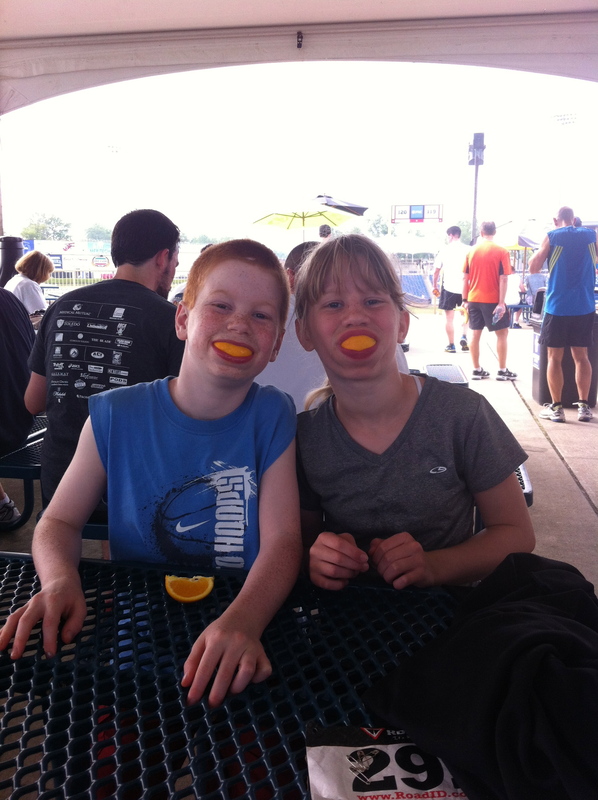 I merrily ate the post-race snacks, sat through the awards ceremony and went home elated. Fast forward to 2013. 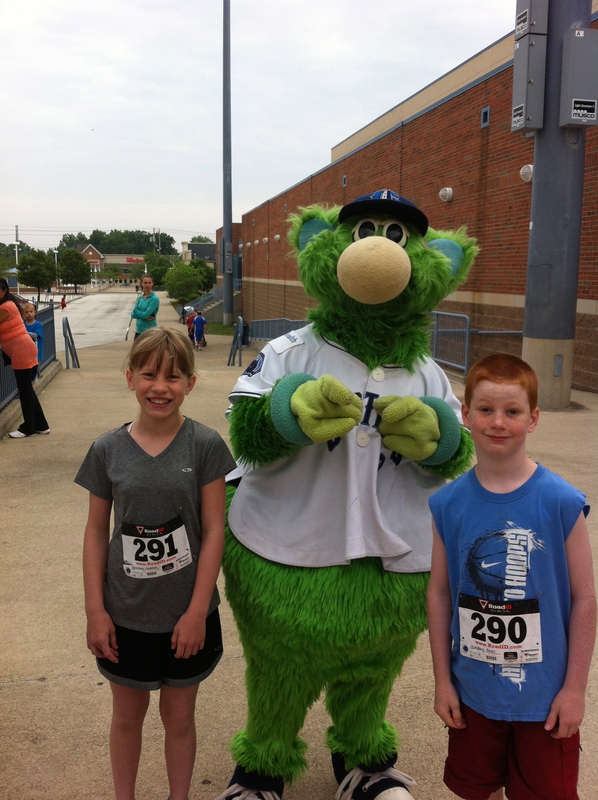 We decided to run this race as a family, Phil running with me and the kiddos running the 1 Mile Skipper Trot, named after the large green mascot from the team. 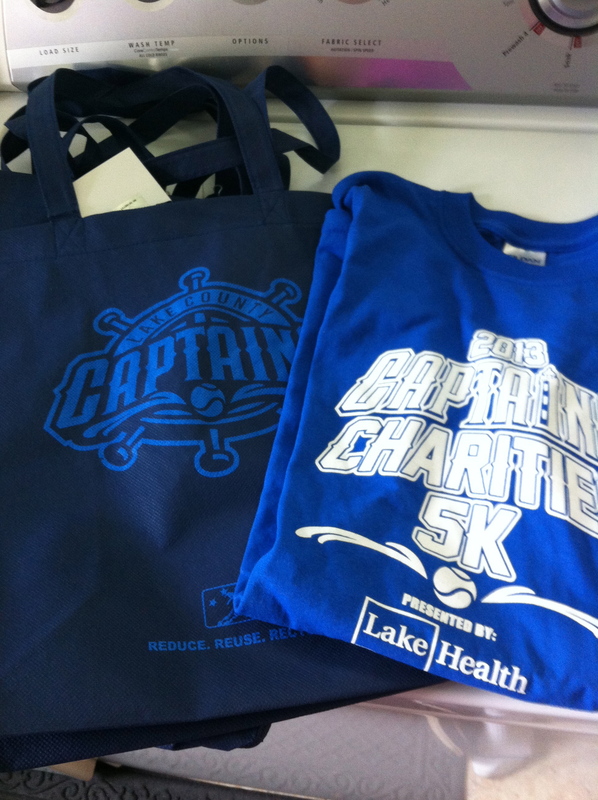 Same day registration was easy and the swag was great: a reusable bag with the team logo, a great t-shirt (I love non-tech race t-shirts, call me old school), and a ticket to a future Captain’s game! The Skipper Trot was first, so we headed out to the start with the kiddos and snapped a few photos before they took off. Hannah and Brody did a great job. After they took off, following a slow-moving Skipper, Phil and I headed back in to the stadium to watch them cross the finish line near home plate. I’m proud of them for making such a great effort. They both came in breathing hard and red-cheeked. I have a feeling that it won’t be too long before Hannah is my regular running partner. 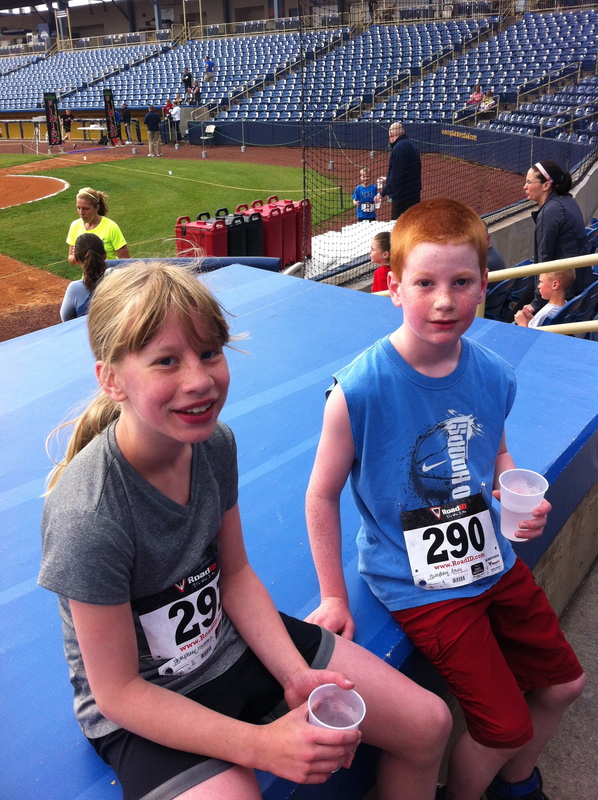 The kids hung out in the stadium while Phil and I headed out to run the 5K. We ran in to two Twitter friends, Bryan and Gary, and chatted for a few minutes before the start. Phil and I planned to run together so I had left my iPod at home. It was only at this point, a few minutes before the start that I realized that I didn’t have my Garmin. I had simply walked out of the house without it. I was OK with it. I’d run this race for the sake of the anniversary itself, not for time. The crowd took off and we headed out on to the loop course. This is not the prettiest course I’ve ever run-it circles through a semi-industrial area that surrounds the stadium, minimizing the need to shut down roads. What the course lacks in scenery, it makes up for in elevation-flat and fast. Phil set the pace and I tried only to maintain my breathing and avoid walking. I skipped the water table and was surprised to hear the race volunteer at mile 2 call out something that sounded like the number 17. As we came through the last mile, I got a little frustrated with the crowd. It seemed like everyone around me couldn’t make up their minds if they wanted to be in front of me, behind or beside. I was shifting direction to dodge people over and over again. Despite the frustration, we hit the back parking lot of the stadium and I could hear the announcer call out a finishing time with the number 24 in it. With another third of a mile or so to go, I got excited. If I could haul it in, I could hit a PR. Without a watch to confirm it, I decided to just go for it. I crossed the finish in 27:22, a new PR of 26 seconds and nearly 5 minutes faster than my 2008 time. It was awesome to have the kids at the finish, to have Phil at my side the entire time (he’ll ditch me one of these days and I’ll be OK with it). We got post-race snacks, saw my Twitter friends again, congratulated them on rock star times, and stayed for the awards ceremony. Much has happened in the past five years-personally, professionally, physically. 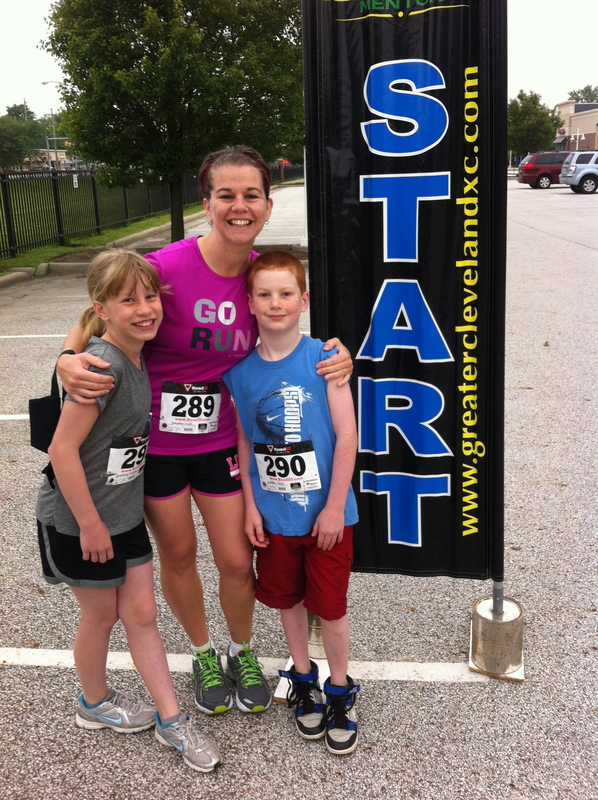 I am thrilled that I was able to commemorate it all by running this race again, this time with my family.